BAK, basis voor actuele kunst presents the publication World Question Center (Reloaded) with excerpts of the performance curated by Jens Hoffmann and realized by BAK at the end of 2003. 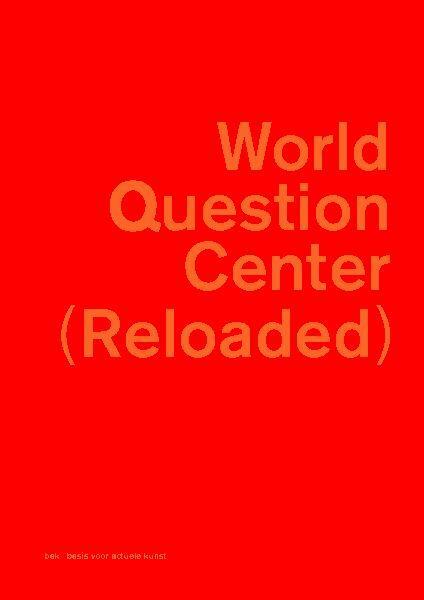 The performance World Question Center (Reloaded) took place on 1 November 2003 as part of a series of projects under the title Now What? Dreaming a better world in six parts. Since then, the themes introduced and discussed during the performance have resonated in both contemporary artistic as well as political developments, and have been a vital source of inspiration, encouragement, and stimulus for our work at BAK. The book presents the responses of artists, theorists, scientists, etc. (including Daniel Buren, Manuel DeLanda, Jacques Rancière, Martha Rosler, Gayatri Spivak, and many more) to the question, which questions they were currently asking themselves, as well as excerpts of the telephone conversations held with them about issues they consider urgent in our time.